Ask The Bellwether: When do you spin S or Z? When do you spin S or Z? People are usually taught (and books usually say) to spin singles Z and ply S.
However, you can and might want to consider the end-use for your yarn and the technique you’re going to use to get there. Crochet prefers the final twist direction to be Z, since it adds Z twist to a yarn. So, if you were to take a final S twist yarn and crochet it, you’d be taking twist out ... and if it were singles, this could be a mess if the yarn then drafted apart again. Knitting depends: British/throw-style knitting typically adds Z twist and German/Continental/pick-style knitting usually adds S twist. If you are doing twined knitting, your two strands will wrap around each other too ... no spinning style I know of can conquer that, except perhaps one of those yarn-ball-wrist-holder thingies that might let the ball unwind as you go, if you are working your Tvåändsstickning from both ends (grin). 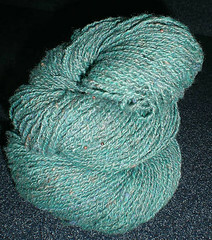 But I did note that S singles, Z ply is the recommended yarn for that method of knitting. I’ve heard that in weaving, if you weave with warp yarn with final twist S and your weft yarn with final twist Z, you get an interesting surface light reflection effect (good interesting, not odd interesting) though most of the weavers I know spin all the yarn for a project one way for both warp and weft. Nalbinders tend to disagree ... I used Z twist and did well with that, as my stitch technique added Z twist, but others report their technique adds S twist. The two full bobbins above are an interesting study ... the top one is spun Z, the second one is spun S. Why'd I do that with the same fiber? All part of a ply experiment, for the "hemi-cable" yarn shown here. ETA: You can tell the top is spun Z because the plied-back sample plies back S (the slant on the plying twist matches the middle bar of the letter S). And the lower is spun S, as the plied-back sample plies back Z -- the slant of the plying twist there matches the middle bar of the letter Z. The yarn is spun from Three Bags Full Turquoise roving, spun S, plied Z with turquoise thread strung with real copper beads, and then plied S on another strand of Z-spun Turquoise. Whew! If you've found direction of spin helpful in your fibery pursuits, I'd love to hear about it, especially if you can enlighten me about spinning for embroidery and the other methods. Thanks! I am curious to know if which hand you crochet with effects the ply direction. i.e. is it best to use a S final twist if you crochet left handed? Unfortunately I can't really figure out at the moment how you crochet right handed! @Eleanor: Hmmm, that's interesting to consider. I'll have to try crocheting left handed and see ... I haven't heard anyone saying anything about lefties for crochet being different, in my casual research on the topic. @kim, yep ... though I've not spun much flax either, I've read the same thing, in books and on-line. It's also an interesting fiber in that it likes to be wetted while being spun. I haven't heard of other fibers also being that way, so I'd be curious to know if there are others that twist S naturally. I crochet with my handspun as well as knit and I have never had any trouble with the twist (I spin singles Z, ply S). I've been spinning for 30 some years and crocheting and knitting for much longer. In weaving you can do all kinds of things with both direction and amount of twist. You get interesting stripes if you use either weft or warp that alternates twist, you get collapse weave that pleats itself if you use high twist singles. The photos of bobbins with Z and S twist singles are labeled wrong. Fibers in Z go from right to left (top to bottom) just like the axis of the z and in S from left to right. Or the photos are flopped over. Actually, the photos are correct -- what you are looking at are the plied-back end sections, which are the reverse of the actual singles twist. The plied-back section of the top bobbin is S, so it's a Z single; and the plied-back section of the lower bobbin is Z, so it's an S single. I should have clarified that in the posting -- so now, I have. Thanks, Kathy S.!